I have always wondered why Umar Akmal and Mohammad Hafeez (the batsman) draw so much criticism from Pakistan's fans and experts. One can understand fans being emotional and lashing out at Umar Akmal for playing a rash stroke or criticising Hafeez for repeatedly failing against Dale Steyn, but for the cricket experts to do the same is quite strange. The moment Hafeez was banned from bowling, critics shared their disapproval on his inclusion in the World Cup squad. They said, "Hafeez is not good enough to be in the squad purely as a batsman." I wonder on what basis such statements were made? While the criticism Hafeez receives mostly comes from the cricket watching public, Umar Akmal's criticism comes from all quarters including the team management, the selectors, and the many experts appearing on TV shows. And that is what is even more bewildering. I say this because in my opinion, Hafeez has been one of the mainstays of Pakistan's batting line up in ODIs over the past 4-5 years, while Umar Akmal is without a doubt the best batsman Pakistan has in limited overs cricket. If we take a look at the time frame since Umar Akmal made his ODI debut, i.e. August 1, 2009, then in the five years since then, both Hafeez and Umar are among Pakistan's leading run scorers in ODIs; and both of them have accumulated these runs at a decent average of 37 and 35 respectively. Hafeez has also scored nine ODI centuries during this time, the most by a Pakistani batsman in ODIs between August 1, 2009 and February 3, 2015. It must be noted here that Hafeez' numbers above are from September 10, 2010, the time when he made his return to the team. 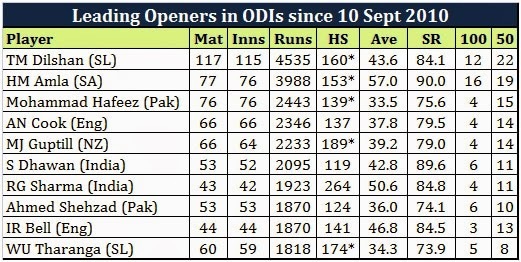 From Pakistan's point of view, there is no doubt that Hafeez has been their best batsman in ODIs over the past 4 years. Now let us benchmark this performance against other international batsmen during the four-year period between September 10, 2010 and February 3, 2015. The numbers surprised me, so I am sure that they will come as a shock to all those who have been particularly scathing in their assessment of Hafeez and his presence in Pakistan's ODI set up. Hafeez is the sixth-highest run scorer in all ODIs played during this period and he is up there among the very best in the business. Is the criticism justified? 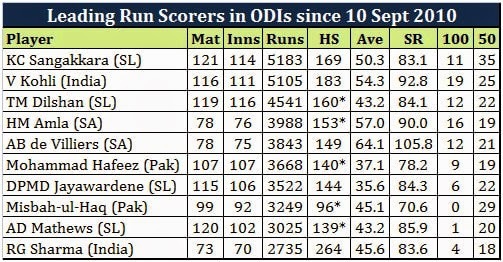 What is even more interesting is that amongst international ODI openers, Hafeez is the third highest scorer in all ODIs played during this same period. Do you think that any other opener for Pakistan during this period, say someone like a Nasir Jamshed or Imran Farhat or Sharjeel Khan, would have been this consistent? They weren't, hence, they were dropped. What startled me more, however, was Hafeez' performance at number three during this time frame. In 29 ODI innings at number 3, Hafeez has scored 1,201 runs at an average of 50 and a strike rate of 85 with 5 centuries and 4 fifties. He is among the only seven international batsmen who have scored more than 1,000 runs at number three during the four-year period between September 10, 2010 and February 3, 2015. Moving on to Umar Akmal; do you know that no one in Pakistan ODI history has scored more runs at number 6 than Umar Akmal has? And he has done it at an average of almost 40, which is a good 8 runs more than the next best average of a Pakistan number 6 (min runs: 650). 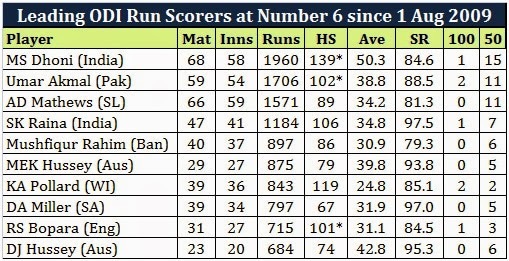 Surely, Umar is the best number 6 Pakistan has ever had. Benchmark this performance against international batsmen and you can see that only MS Dhoni has scored more runs at number 6 than Umar has during the 5-year period starting August 1, 2009, the day Umar made his ODI debut. 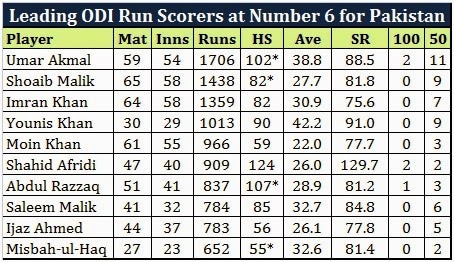 And only Dhoni and the Hussey brothers average more than Umar at number 6 in ODIs during this period (min runs: 650). Umar Akmal is undoubtedly one of the best lower order batsman the world has seen in ODI cricket. He is among the only four international batsman who have scored two ODI centuries while batting at number 6. The other three being Shahid Afridi, Keiron Pollard, and Chris Cairns. No one in the history of ODI cricket has done it thrice. The fact that the Pakistan selectors were contemplating including Kamran Akmal or Mohammad Rizwan instead of Umar in the World Cup squad is nothing short of criminal. It amazes me how a batsman like Umar Akmal faces so much criticism. One can understand a backlash from overzealous fans. But to face flak from former cricketers and experts who understand the game better than most is just incomprehensible. I leave you to ponder about why you want Hafeez and Umar out of the squad. And I leave you with another interesting stat: besides Zaheer Abbas and Saeed Anwar, Umar Akmal is the only Pakistan batsman to average over 35 with a strike rate over 80 in ODIs.